After far too many delays it is finally done! We have a new website everyone! Let me say that again: the new www.spectrum-scientifics.com is up and running! Its still ‘fresh off the presses’ so to speak, so there might still be a few tweaks. But take a look! The age of flat-rate, cost-based shipping is over! Now the shipping costs are set to what it actually costs to ship your order. No longer do the people buying a piece of polarizing film need to pay the same rate as someone buying a heavy Newton’s Cradle. The customer can also choose if they prefer UPS or Priority Mail USPS. In the future we hope to add further options such as overnight & 2 day shipping to the selection. In the past, we accepted all major credit cards. This was fine but in this age many online shoppers prefer to have other options. That is why our new site also accepts PayPal and Google Checkout. This will give customers the payment flexibility they want. We admit it, the old site was getting kinda messy, with tons of products being shoved into 1 huge category (labware, we are looking at you) with little to break it down. The new website has much better categorization of products, so that if you want a griffin beaker you can just go to the griffin beaker subcategory rather than having to wade through every other piece of labware we carry. Its not just the people looking for labware who get all the benefits. Now you can shop for science toys by age or for under a certain dollar amount! make sure you get the right toy at the right price! Don’t want to buy right now, but don’t want to have to rebuild your cart full of goodies later? The new Spectrum Scientifics webstore now has a wishlist! you will need to be signed into your account to use this feature. Our old website only allowed one images, and a rather small one at that. People want to actually SEE the product so the new website has larger pictures (when available) and in some cases multiple pictures of the product! Like one of our products? Want to share it with your Facebook friends or Twitter followers? Its just a click of a button away on our new product presentation. There are some drawbacks to the new website. Sadly if you had an account with our old website it is no longer available. We were unable to transfer the accounts from the old website to the new one. So unfortunately, you will need to make a new account if you want all the features. But that just takes a minute and it means a much better experience for your shopping! Come check out the new website today! It isn’t a daily event here at the store, but it sure does happen a lot. People find/refind/salvage an old telescope and they want to know if it is a)valuable or b)can be made to work again. The short answers to those questions are a) Probably not and b) maybe, but is it worthwhile? Here’s the facts: almost 90% of the telesco0pe we see brought in to the store are small refractors. They are usually older versions of something like this Orion Observer 60. 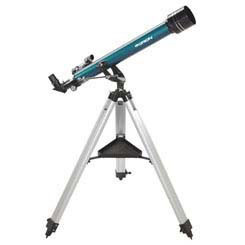 Small refractors make up a huge portion of telescope sales today, especially for beginners, and it was no different 10,20, 30, or 40 years ago. 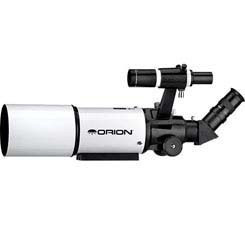 They are usually the least expensive models available and were sold in camera shops during the holidays – larger telescope you usually had to send away as mail-order. These small refractors had company names that often are not around anymore: Jason, Telestar, Bauch & Lomb, and so on. Now you may notice from the link above that the Observer 60 has a price of just under $100. Remember that number because as your telescope get repaired it is going to cost money – and at a certain point you might think that maybe getting a new telescope is more economical than repairing an old one. Unsalvageable – At one astronomy club’s star party I once saw a visitor who had brought his old telescope for the club members. When he tilted the end to the ground the lens fell out – followed by a pint of rust flakes. This was a pretty cut and dry case, but in some cases it might not be so obvious what is unsalvageable. 1) Bakelite telescope bodies – I’d be amazed any telescope with this kind of body survived as long as it did. 2) Plastic telescope bodies – These can vary a lot. Some are actually decent or even ABS plastic. But the models with cheap colorful plastic aimed for very little kids are usually not worth saving. 3) Damaged Tripod legs – The shift in low-cost telescopes from wood legs to aluminum legs only took place about 12 years ago, so most old telescope often have wood tripod legs. Wood is fin but it can warp from moisture or splinter from pressure. If there is damage to the legs or the bracket on the tripod legs odds are it is not worth repairing. 4) Missing main lenses or mirror, missing eyepieces are one thing (see below), but if you telescope is missing the main lens/mirror it will not be worth saving. 5) Bends in the tube. Dents are one thing, a telescope with bent tube simply is not going to work. 6) Rust – usually only happens with reflectors, but rust inside the tube is big trouble. Outside is no so big a deal. Needs Parts – Most old telescopes are physically just fine but are just missing a few things. Telescopes often have lost the little things that came with it, such as the eyepieces. This is a problem as the eyepieces are need for the telescope to work. The good news is that you can often buy these parts – but it might get harder to do so in the future. 1) Eyepieces – second only to missing diagonals, eyepieces are usually what most found telescopes are lacking. This is not too much of an issue as you can usually buy new eyepieces. Trouble is, when they run $20-30 per eyepiece you use up a lot of that ‘$100’ figure we mentioned earlier. Another issue with eyepieces is the size. Times were most low-cost telescopes were made in Japan and used eyepieces that had a .965″ (25mm) barrel diameter. The US standard was 1.25″. As time went on and manufacture of low-cost telescopes was moved to Taiwan and then Chine the US standard was used more frequently. This is good as people buying a new telescope have a better design, but it also means that there is less reason to make the smaller lenses. 10 years ago the major telescope suppliers made decent design .965″ eyepieces. But the need for them dried up with the old Japanese models so they stopped making them. If you cannot find .965″ eyepieces you may need to use and adapter and US standard eyepieces. 2) Diagonals are probably lost more often than the eyepeices. They have the same sizing issues and unfortunately can be harder to find than eyepieces in the .965″ standard. Some telescopes can still come to focus without their diagonal, but some cannot. 3) Finder Scope – While lacking a finder scope does not make the telescope useless, it does make it much, much, much harder to use. Usually most old telescopes had a cheap, plastic 5x finder that are difficult to adjust. A LED reflex finder is a much better option, although you may have to buy it and a bracket to attach it. 4) Dust caps – Without dust covers your optics will likely accumulate dust and grime. If these are missing you might want to improvise something as they will be hard to replace. A clean cloth held on by a rubber band can work for short term storage of a telescope. Mechanics – Things fall apart, but they can often be repaired. 1) Small dents and dings – these usually won’t affect much. Even the most severe dent a tube can take before bending is not likely to block the light path. 2) Tripod parts go missing. Some of these can be lethal to the telescope’s recovery. Brackets that are attached to wood tripod legs can bend or break and are not worth repairing or replacing. On the other hand, often what gets lost are thumbscrew and bolt systems that attach the tripod leg to the accessory tray that keeps the legs properly sturdy. These can usually be replaced at a local hardware store for a small amount. 3) Stick legs. Wood swells. Sometimes it bends but often what happens is that the center portion of the tripod leg swells up and can’t be adjusted. You may need to use some strength to get it loose again and it may require some sanding or grease. No cost to fix this, however. If the swelling results in bent or broken legs, however, you are back into the unsalvageable category. Optics Cleaning – Unless your telescope was sealed in a box it is likely to have some dust on its optics, or worse. 1) Dust. This can be blown off with a rubber ‘blower bulb’. It is important to clear the lens or mirror of dust if it needs more cleaning in any case. 2) Grime, etc. Lenses can be cleaned with the proper lens cleaning fluid. Look for optics cleaning fluid that is suitable for optical coatings. Don’t use window cleaner. Be sure to use optics cleaning tissues as well as using household tissues and paper towels can damage the lens and coatings. 3) Mirrors with grime. These need to be cleaned, and here are some instructions on how to do so. This list is by no means comprehensive – the number of things that can be wrong with an old telescope is enormous. But it does give you a sense of what the costs and efforts would be for salvaging an old telescope. Paper airplanes are an inevitable result of having loose sheets of paper around. We make them as kids, and we even make them as adults. When we were young, we did always dream of having a paper plane that would fly better than our arms could throw them. Well, now there is a chance to experience just that! Its the Power-Up set and it turns your ordinary paper plane into a electric powered flying machine! Assembling the Power-Up requires some adult supervision but can be done by any child from age 8+. Once your put it together it is time to take it outside (unless you have a huge gymnasium to fly it), charge it up and make that plane fly! A standard charge from the charger will provide about 30 seconds of flight and it only takes 20 seconds to charge. 3 ‘AA’ batteries are required for the charger and are not included. Oh, and you do have to provide your own paper airplanes. Just sayin’. Why The Delaware Valley Can’t Pronounce ‘Orion’ Properly. Ever since we opened the Spectrum Scientifics store in the Manayunk neighborhood of Philadelphia, we have carried Orion Telescopes. They are good quality telescopes and they stand behind their products. But in the Philadelphia region, we have noticed something rather odd. Say the word ‘Orion’ out loud. You probably said it ‘Oh-Rye-on’ if you are like 98% of the US population. But in the Philadelphia region, you might not pronounce it that way. It was something we noticed in the store almost from day one. For some odd reason people in this region prefer to pronounce it “Ore-ee-on”. The reason for this, we could not understand. Philadelphians certainly have their accent. We pronounce ‘Water’ as ‘wudder’ and the PA region is sometimes fond of pronouncing “creek” as “crick”. Accent quirks are certainly not unknown to us. But there is no follow through here. Changing water to wudder, of saying ‘jeet’ in place of ‘Did you eat?’ doesn’t make Orion turn into a different word. Now Orion, despite being one of the most recognizable constellations in the sky (and one of the few that looks like what it is supposed to be) is not a familiar word to most people. But a sample survey of Facebook friends found that most who knew about the constellation (or should know about it) pronounced it normally. But still whenever we were called by a perspective local telescope buyer they would ask “Do you carry the…Ore-ee-un Observer 70?’. This pronunciation seems to happen anywhere else in the country. We could not figure out why this happened. What this woman is talking about is not relevant to this blog post. What is important is who she is. She is Orien Reid Nix, a prominent consumer reporter for channel 10 news for many years. Here name, at least in the Philadelphia region, is pretty much a household name. She has been a reporter in the Philadelphia region for decades, her first name, Orien, is actually pronounced “Ore-eeh-un”, and it is unusual enough that it wuold stick with most people’s memory So with that in mind an average person in the Delaware Valley would probably default to the pronunciation of her name based on their cultural memory as there is but one letter difference between Orien Reid Nix and Orion Telescopes. So there you have it. Thanks to the fame of a local reporter an entire region has trouble pronouncing the name of a constellation and telescope company!